Online Freight Calculator. Shipping cargo from the USA. This real-time online freight calculator above designed to get you instant access to international LCL sea freight rates by well-known and most reliable U.S. ocean freight carriers to ship cargo from the USA overseas. If your concern of shipping boxes, crates or pallets from the USA, then you are welcome to use it. It is free to use. Begin calculating the cost of shipping boxes, crates or pallets by selecting your destination country. This online freight calculator perfectly works as for experienced exporters as well as for first-time international shippers. It is also a great tool to manage to ship from the USA sizable purchases on the Amazon, eBay or virtually any seller in the United States. With this online freight calculator, you have remote access to the business in any country listed on the freight calculator. Click on the picture below to watch a three minutes video on YouTube about how to calculate freight cost on cargo shipping from the USA overseas. With this online freight calculator, you can schedule an LCL ocean freight shipment from the USA overseas online 24/7, at virtually any location around the world, no matter if you travel from place to place. Having access to our website is all you need to initiate your international shipment. After you quoted and booked a shipment, it provides a variety of payment options and supports international shipping documents flow online. As you are calculating an international price quote with this LCL sea freight calculator, you may decide either to self-deliver your boxes, crates or pallets to the nearest to you freight shipping terminal, or request to pick up (collect) it at your cargo location. Shipping freight terminals that are in upper case, highlighted, and listed WITHOUT asterisks (ATLANTA, GA for example) are direct international ocean freight carrier facilities professionally called CFS - Container Freight Stations. Freight rates in international shipping from the USA for cargo self-delivered directly to the ocean freight carrier's terminals (CFSs) are based on their size only (overall chargeable volume per cubic meter). WEIGHT FOR SUCH INTERNATIONAL SHIPMENTS IS NOT A PRICING FACTOR unless its density does not exceed the limit nominated by the carrier, which is most often equal to 1654 lbs (or 750 Kilograms) per Cubic Meter. If you're shipping from the USA a regular cargo, then the weight of your freight most likely will not exceed the limit. When you submit documents related to your international shipping, the U.S. Customs requires to estimate the weight of cargo for statistical purpose only. Then keep in mind that in international cargo transportation from USA using LCL, shipping freight self-delivered directly to ocean freight carriers terminals (CFSs) is the cheapest way to ship boxes, crates or pallets overseas. There will be no additional shipping cost to take cargo on board of the vessel. However, freight terminals marked WITH asterisks, and in lowercase (Akron, OH* for example) are local U.S. domestic LTL carriers terminals. Cargo delivered to such terminals needs to be transferred (line hauled) to an international ocean freight carrier's facility (CFS). In other words, freight self-delivered to LTL freight terminal are subject to additional U.S. domestic line haul charges on top of the international ocean freight. Keep in mind that if you are unable to self-deliver your shipping boxes, crates or pallets to a shipping freight terminal, then you may ask or hire someone to deliver your goods on your behalf. It is not necessary to be represented in person at a time of cargo delivery. Eventually, with this freight calculator, you can also request to PICKUP (to collect) your shipping boxes, crates or pallets at your cargo location. Then a pickup charge will be added to your international shipping freight cost. 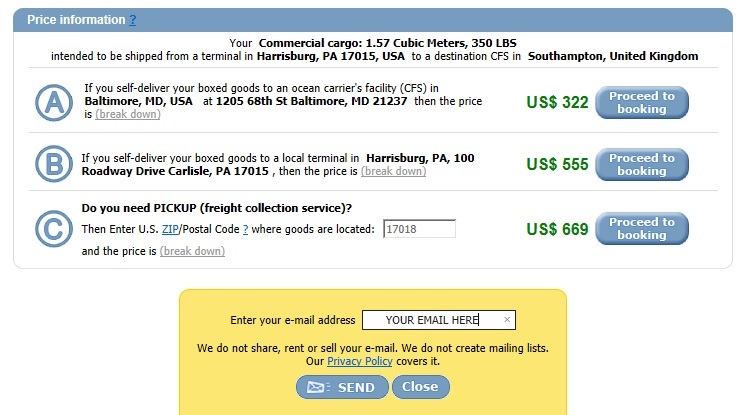 Pickup cost will be calculated based on ZIP code (U.S. postal code) of your cargo location entered in the final step of calculation of your total shipping cost in the online freight calculator. If you need a pickup, the select an appropriate pickup option in the 'Do you need a pickup?' drop-down menu. I.e., choose the type of goods and the pickup location: either you are shipping from the USA a commercial cargo or personal belongings. International freight shippers should be aware that U.S. domestic Line Haul and Pickup charges are based on the dimensional weight and freight class of shipping cargo. Find more about dim. weight and freight class in this link. At the end of calculation type your ZIP code and get a shipping cost including the pickup option. Provide a valid email and submit your international sea freight quote request online. You should receive our reply email with the complete ocean freight quote momentarily. Experience difficulties to find a U.S. ZIP code? Use ZIP Code Lookup. How do I find an address for my cargo delivery in the USA? The advanced database in the online freight calculator contains numerous international ocean freight carriers and U.S. domestic U.S. LTL carriers addresses related to shipping cargo from the USA overseas. Each carrier has an exclusive freight terminal within a city-zone. 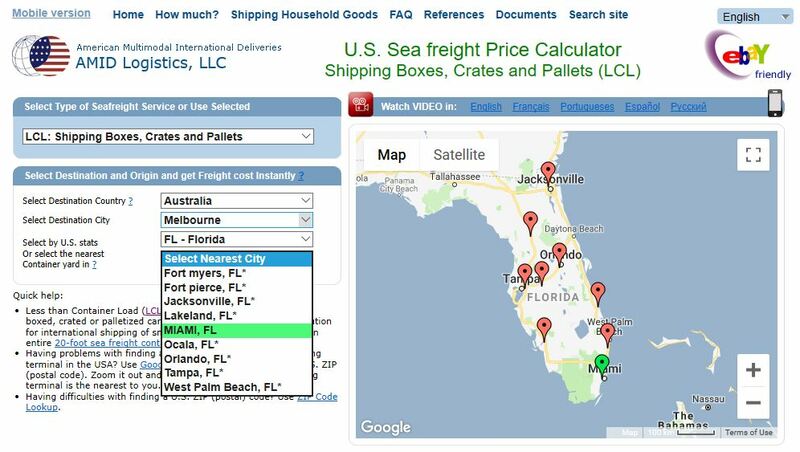 Terminals are located in cities that listed in the freight calculator. As soon as you got a freight price quote in the freight calculator, you should see the addresses in the quote. See the screenshot above. However, upon booking via the quote, the freight delivery terminal address and the contact phone number must be re-confirmed on every single shipment. This information will be reconfirmed in the email with our shipping instructions generated on your shipping from the USA. In other words, upon your booking request submitted online via your freight quote obtained in the freight calculator, and deposit payment, we will initiate your international shipment. We will match up the shipping freight terminal provided it the freight quote to the up to date ocean freight carrier's availability. You must not deliver your cargo to the shipping freight terminal until receiving our email with shipping instructions and your dock receipt (and, if necessary, LTL carrier's bill of lading). Having our shipping instruction, you can deliver your boxes, crates or pallets to the freight terminal to initiate you shipping from the USA overseas. You might call to the freight terminal in advance to find about working hours, directions, etc., or regarding your pickup conditions if a cargo pickup requested. For shipping cargo self-delivered to an ocean freight carrier's terminal (CFS), it is the OCEAN FREIGHT CARRIERS BOOKING NUMBER that you got in our shipping instructions. For shipping cargo self-delivered to a U.S. domestic LTL freight terminal, it is THE LTL CARRIER'S INLAND BILL OF LADING NUMBER. If a pickup requested, then it is the unique PICKUP REFERENCE NUMBER. Important: Shipping freight from the USA overseas is a complex process. Each international shipment is unique. To eliminate any misunderstandings or mistakes, you MUST NOT accept any verbal statements as final (particularly on a shipping freight terminal location). All commitments and promises MUST be documented in email. Do not deliver cargo to shipping freight terminals without completing bookings online or before receipt of our shipping instructions. Your shipment will not be recognized, cargo not be accepted, and you return it. You may consider our shipping instructions a ticket for your international shipment that you need to purchase in order to ship freight from the USA. Other options in the freight calculator. Value of shipping cargo. To calculate a complete shipping cost with this online freight calculator you have to assign a value of shipping from the USA goods. Depending on the value you can consider options on filing U.S. shipper's export declaration and maritime cargo insurance. At a time of calculating shipping cost in the online freight calculator, you just estimate the value. You will be able to change the value at a time of booking. Finally, the value of shipping cargo will be declared based on the value in your commercial invoice or the valued packing list. You can prepare this essential shipping document later. However, it must be provided before cargo will be delivered to the international ocean freight carrier's terminal (CFS). If for some reasons you do not have any commercial invoice OR you are shipping from the USA household goods or personal belongings that are not to sale, then you can assign a value on your shipping goods by yourself in a form of valued packing list/proforma commercial invoice. With this online freight calculator, you will be able to submit your valued packing list/proforma commercial invoice online, via a link provided in our shipping instructions. DO NOT ATTACH ANY SHIPPING DOCUMENTS TO YOUR SHIPPING BOXES, CRATES OR PALLETS. All documents must be submitted electronically. About the U.S. Shipper's Export Declaration (SED). While you are calculating shipping cost in the online freight calculator, you select an option on U.S. Shipper's Export Declaration. If you are shipping from the USA goods with the declared value less than US$2500, your international shipment is exempt from filing the U.S. Shipper's Export Declaration. Your ocean freight bill of lading will state: NO AES REQUIRED, AS CARGO VALUE UNDER $2500 (SECTION FTR 30/37A). If the value of your shipping cargo is US$2500 and higher, then your international shipment must be declared to the U.S. Customs by submitting a U.S. Shippers Export Declaration (SED). Then, in the online freight calculator, you should select an option on the filing. International shippers can submit U.S. Shippers Export Declaration by their own in the U.S. Customs and Border Protection website ace.cbp.dhs.gov. Otherwise, you can select the option in the online freight calculator, and ask us to submit it on your behalf for the fee $35. To submit a U.S. Shippers Export Declaration on your behalf, we will need from you either your consigner's U.S. employer ID number (EIN) OR a copy of foreign (not U.S.) passport's page with photo and clear passport's number on it. Note, that the U.S. Customs does not accept SSN on SED filing. If you are the U.S. Citizen, then you have to provide EIN. Read about U.S. SED in this link. Read about obtaining U.S. EIN in purpose to ship cargo from the USA valued US$2500 and higher (if you do not have one) in this link. Finally, as you calculate an international shipping cost in this online freight calculator, you have options on Maritime cargo insurance coverage. The cargo insurance on shipping freight from the USA is optional. Make your selection at a time of quoting. You will be able to change your mind at a time of booking. Read more about Maritime cargo insurance and international Ocean freight shipping carriers liabilities in this link. AMID Logistics, LLC (American Multimodal International Deliveries) is licensed and bonded U.S. Freight Forwarder, U.S. OTI - Ocean Transportation Intermediary. Since 2007, our primary business is the international cargo transportation from the USA by sea. Particularly, shipping from the USA LCL freight. I.e., shipping from the USA cargo in boxes, crates, and pallets. From our office in Philadelphia, Pennsylvania we manage international shipments virtually from any location in the United States. Having years of experience, we support businesses and individuals around the world in their international cargo transportation needs in shipping cargo from the USA. We support shipping from the USA Household Goods and Personal Belongings as well as shipping from the USA variety of Commercial Freight. Household Goods and Personal effects international shippers should consider our Economy LCL Sea freight service for shipping boxes, crates, and pallets versus shipping their belongings with international moving companies. We are welcome you to utilize our online freight calculator in your international shipping needs. Our online freight calculator is a part of our international shipping system. It works in real-time online 24/7. With this online freight calculator, you will calculate the international shipping cost of shipping boxes, crates, and pallets in minutes. We are also welcome you to participate in our AFFILIATES AND REFERRALS NETWORK. You can read AMID Logistics client testimonials and CUSTOMER REVIEWS. Please do not hesitate to CONTACT US about your business related to shipping freight from the USA.